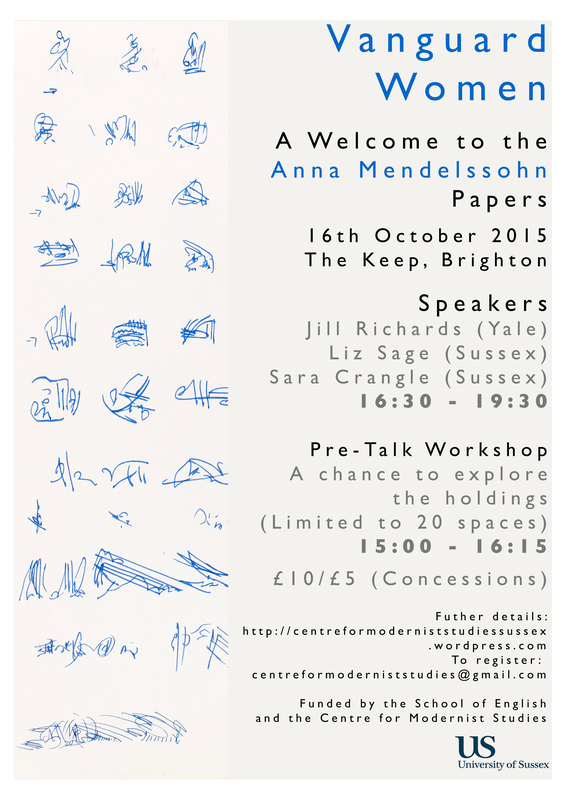 Please see below for the poster for the event “Vanguard Women – A Welcome to the Anna Mendelssohn Papers” which will be held at The Keep, Brighton on Friday 16th October 2015. This event is being organised by the Centre for Modernist Studies at the University of Sussex and will feature a series of talks, open to the public, given by academics talking on the theme of “Feminism and Vanguardism” in different historical moments, covering the fin de siècle and modernist periods, post 9-11, and 1968 and its environs. The speakers are Jill Richards (Yale), Liz Sage (Sussex), and Sara Crangle (Sussex). There will also be a pre-talk workshop led by the Head of Special Collections at Sussex, Fiona Courage, and the collection’s archivist, Simon Coleman, which will give participants the opportunity to explore the holdings and learn more about the way in which the archive has been collated and catalogued. Limited to 20 spaces. Further details of the event can be found on the Centre for Modernist Studies website. Registration must be made in advance and the fee is £10 / £5 concessions (including students). Participants attending both sessions will only pay once. To register please send your full name, your institutional affiliation (if any), which session(s) you would like to attend along with any dietary or access requirements to centreformoderniststudies@gmail.com.